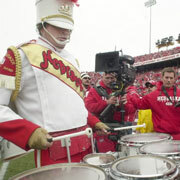 In one of the less likely reality situations we've seen since, I don't know, Thursday, tonight NBC premieres Tommy Lee Goes to College, where the Motley Crue drummer hits the university of Nebraska. Hey, I thought Motley Crue was banned from NBC for life? Isn't this show close enough? The body's barely cold, and companies are already cashing in on Peter Jennings' death. Anchor Bay Entertainment is set to release The Peter Jennings Collection, a two-disc DVD set featuring six documentaries hosted by the late ABC News anchor on October 18. The six primetime investigative news specials aired over the past two years on ABC. Sure, this release would probably have happened anyway, but the announcement kinda smacks of tastelessness to me. Kathie Lee Gifford, irritating bible thumper and former morning show co-host, is joining world-class answering machine champ Pat O'Brien on the gossip show The Insider as a special correspondent starting September 12. She will conduct celebrity interviews and cover Broadway. Good God- as long as she doesn't sing. Roger Ailes, already chief of cable's top news channel, will add News Corp's owned and operated TV stations to his responsibilities. The post became available when Lachlan Murdoch, Rupert Murdoch's eldest son snd apparent heir to his media empire, mysteriously vacated the gig last month. Ol' Rupe hopes Ailes can duplicate the amazing job he did at Fox News Channel, where he overtook CNN to become the biggest cable news channel on television, overtaking rival CNN. Oh, ick. More off-key caterwauling from one of music's most untalented lip-synchers. Guess that petition did nothing. Big shock. Fox has announced that Paula Abdul will return as a judge on American Idol this season. Its internal investigation offered no proof that she and former contestant Corey Clark got it on. I don't know about you, but I feel so much better.